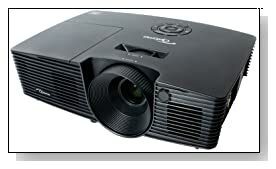 Finally one of much awaited full 3D supported multimedia projectors is available in market. The new Optoma DW333 WXGA projector by the well-known brand has got good specification at competitive price. The recently released model comes with highly durable lamp and has got cutting-edge technology. Optoma is one of the reliable brand with value-packed product offerings, but we wanted to explore actual worth of this new model. Here is our Optoma DW333 Review to help you to decide whether this model is worth a buy. The Optoma DW333 comes with 1280×800 WXGA resolution. The model is powered by super bright 3000 ANSI lumens lamp which lasts for 10,000 hours. Brilliant contrast ration of 18,000:1 and full 3D support. The new model from Optoma is special designed for educational institutions and office presentations. Looking at the specification, the projector has got high-end technology under-the-hood to produce good quality images and videos. Its 3000 lumens and 18,000:1 contrast ratio offers enough brightness to videos. The specification is not adequate for a superior home theater installation but sharpness and details produced by this projector is astounding. The model also has got ten preset profiles for color enhancement, which works amazingly for a better video watching experience. The model has got array of input ports including standard HDMI, micro USB, VGA, S-Video, co-axial video, RS-232C and Audio In/Out. This Optoma projector doesn’t come with sensors and needs manual focus adjustments. Coming to design, the model doesn’t sport distinctly attractive looks, but feels sturdy and durable. Quality of its plastic outer cover is comparable with other premium range models. The device weighs approximately 6 pounds and compact in design. The design is suitable for both ceiling mount and table top. Overall, the new Optoma DW333 has got decent specification to offer good performance. The model is suitable for low-budget home theater installations and office presentations. Considering the price tag, brand name and quality of the product, we feel it’s a good deal to consider buying. If you’re looking for a high-end home theater projector, we suggest you to increase your budget and check out other premium models from the company.